Copyright © 2015 Intersect Systems Inc.
New OCR Document Automation Document automation depends on OCR, or Optical Character Recognition – the process of recognizing text from an image. Intersect has carefully researched available OCR engines suitable for document processing with area capture fields, and has selected the current state-of-the-art in document OCR processing. The addition of OCR capabilities to the established document indexing processes in Intersect’s Records Control and Management System (RCAMS) includes a special software tool to support scanning template configuration, with name-and-save options for job templates, allowing convenient point-and-click job operation. 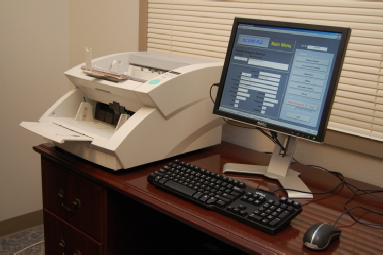 Bar Code Option Physical records storage and management remain an important part of any records center operation. Intersect Systems has added a frequently-requested option to the standard RCAMS system that supports bar code management of containers and storage spaces. 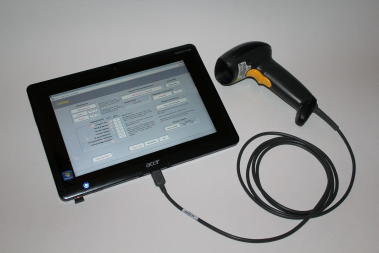 Operating on a Windows-based tablet or notebook computer with a local Wi-Fi link to the RCAMS system, a user can place a container in an available space in a records center, wand a barcode on the shelf space, then wand the bar code on the container, and the container is immediately assigned to that space in the live database. A container can be un-assigned for removal for shredding or transfer by wanding the container bar code. Records Retention The Texas State Library and Archives provides a comprehensive set of retention schedules for Texas Local Governments and State Agencies. For twenty years Intersect Systems has provided a specialized, comprehensive text editor and word processor to help Texas Local Governments and Agencies create specific local control schedules with simple point-and-click selection of applicable record series, and then to publish local retention control schedules – both master copies, and sub-sets for individual departments. 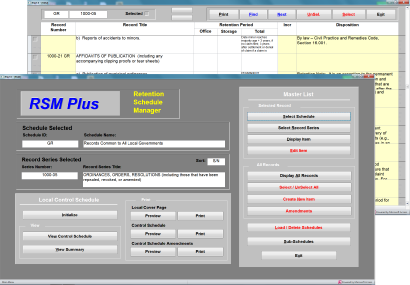 For 2018, the popular Retention Schedule Manager has been enhanced, expanding support for reporting amendments to the Library, as well as expanding publishing options to create web pages with a point-and-click operation for posting on an organization’s internal intranet, or on the Internet, to provide convenient look-up access to departments.